Photo by Mark McKenna A Cal Fire helicopter lands at an old nursery on Green Diamond property near the crash site of a Cal-Ore Life Flight plane on Friday morning. 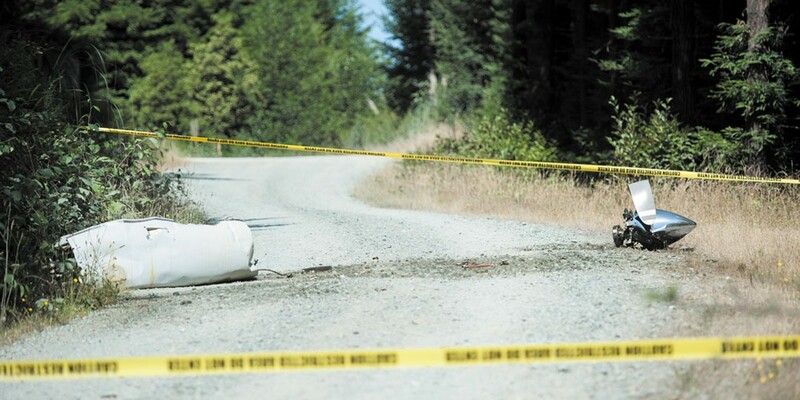 Photo by Mark McKenna What appeared to be the engine and propeller of a downed Cal-Ore Life Flight Plane lie on a service road on Green Diamond Property north of McKinleyville. According to a press release, the pilot reported smoke in the cockpit and was attempting to return to Crescent City when radio communication was lost and the plane lost radar contact. A federal investigation is underway to determine what caused a medical transport plane bound for the Bay Area to crash just north of McKinleyville in the early morning hours on July 29, killing all four — including a patient — on board. Cal-Ore Life Flight identified the crew as pilot Larry Mills, flight nurse Deborah Kroon, and flight paramedic Michelle Tarwater. All of the victims, including 35-year-old patient April Rodriquez, were from Crescent City, according to the Humboldt County Sheriff's Office. "This is one of the saddest moments in our history. First and foremost, our thoughts and prayers are with the families of the patient and our crewmembers." REACH Air Medical Service President Sean Russell said in a statement. The twin-engine Piper PA31 was traveling to Oakland when it went off radar 5 miles north of Arcata, shortly after Mills reported smoke in the cockpit at 1 a.m. and indicated he was returning to Crescent City. National Transportation Safety Board investigators completed field work at the crash scene — a remote stretch of timberland owned by Green Diamond — over the weekend. The aircraft has been moved to Sacramento for a wreckage layout examination, according to NTSB Chief of Media Relations Christopher O'Neil. A preliminary report by the agency, charged with investigating civil air crashes, is expected to be released in the next two weeks. 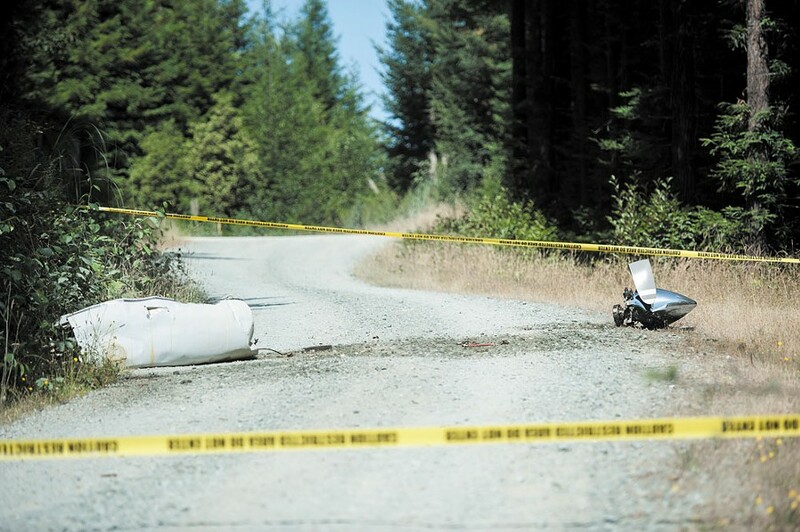 A Green Diamond employee found pieces of the plane along a logging road around 9 a.m. July 29, directing search and rescue team members to the area where the four victims were located inside the fuselage, Undersheriff William Honsal said. "Part of the debris was on fire or was smoldering, so we had Cal Fire and Arcata Fire called to assist," he said. "We then notified the FAA and NTSB. Once it was determined that there were no survivors, the NTSB and FAA gave us the authority to extricate the bodies from the plane." The crash left a quarter mile debris field. Honsal said the sheriff's office received word of the missing plane soon after it lost radio contact and dispatched patrol deputies to its last known coordinates, near Crannell. The sheriff's office also put out calls to regional airports to see if the plane had landed. At daybreak, with no signs of the aircraft, a sheriff's office search and rescue team set out with assistance from Civil Air Patrol, the California Highway Patrol, Cal Fire, the Coast Guard and Green Diamond personnel. "We are all really heartbroken because we are all dependent on the Life Flight personnel because we live in such an isolated place," Honsal said, noting the crews have transported numerous accident victims as well as sheriff's office staff, their family and friends. "This hit too close to home for a lot of us," he said. The medical transport company, which merged with REACH Air Medical Services in 2011, serves the rural areas of California and Oregon. 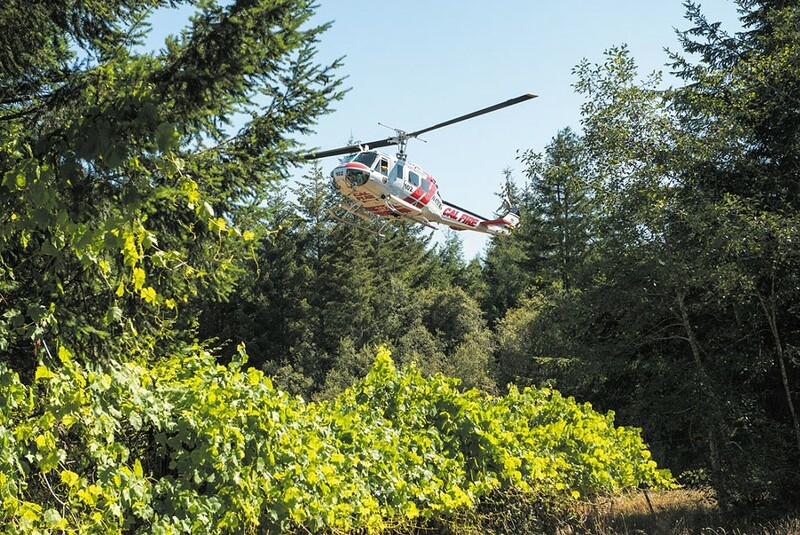 According to the company's website, Cal-Ore has responded to more than 50,000 emergency calls for ground and air ambulance service since it began in 1998. National Weather Service Science and Operations Officer Mel Nordquist said conditions at the Arcata-Eureka Airport around the time of the crash were misty with light winds and overcast clouds at 200 feet. A memorial service was set for Aug. 3, with a procession from Crescent City to Brookings, Oregon, where the Cal-Ore office is based. An experienced pilot with more than 20 years of flying experience, Mills was remembered by the company as a devoted father and husband with a ready smile and gentle nature. Mills, a volunteer first responder for 12 years, was 54. Kroon, a 49-year-old flight nurse who had been with Cal-Ore since 2014, was a New Zealand native who made her home on the North Coast after spending 25 years as a critical care nurse in hospitals across the United States, according to the company statement. She was recalled as a "free spirit" who cherished her dog Oscar and her horses. One of the first in the region to obtain certification from the National Registry of Emergency Medical Technicians-Paramedic, the 30-year-old Tarwater was described as a natural caregiver with a penchant for gardening. She had been with Cal-Ore since 2011. "We all have the same questions, but until we have factual reports from the NTSB, there is nothing more we can share," Russell said in the statement.